NORTHAMPTON—United States Senator Ed Markey brought the Green New Deal to the 413 to build popular support for the proposals underlying goals. 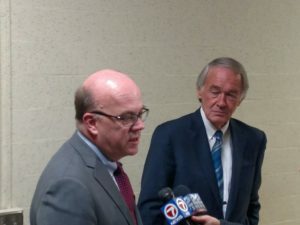 Markey introduced the ambitious climate manifesto alongside New York Representative Alexandria Ocasio-Cortez earlier this year. Since then, it has started a conversation, but the Sunday town hall aimed seize that conversation and turn attention toward the substantive legislation the resolution envisions. To a certain extent, the liftoff had to contend with other events. On stage with Markey and US Representative James McGovern was the ghost of the Mueller investigation. Earlier in the day Attorney General William Barr released his initial summary of Special Counsel Robert Mueller’s investigation into Russia’s meddling in the 2016 election. 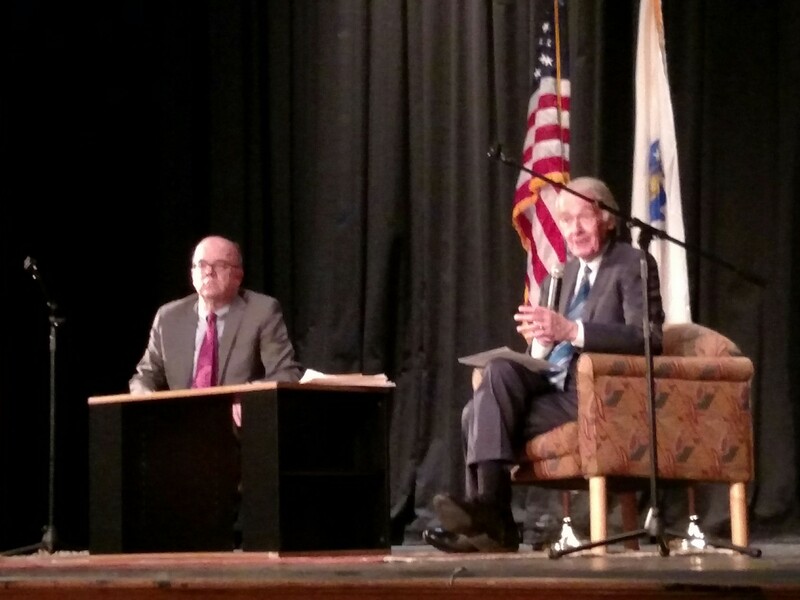 Though the issue did not swamp the town hall, both Markey and McGovern spoke with the crowd and with reporters about the Barr’s synopsis. As it left more questions than answers, both demanded the full report’s release. The town hall, held at Northampton High School, began after a series of introductions. Mayor David Narkewicz, State Representative Lindsay Sabadosa, and Senator Jo Comerford all took turns at the podium to press for action and thank Markey and McGovern for their leadership. In the heart of Upper Valley progressivism, the two lawmakers found a warm reception. They came on stage with standing ovations. Questions, at least early ones, were substantive. McGovern, whose chairmanship of the Rules Committee came up in Comerford’s introduction of him, noted the importance of Democratic control. When confronted with fears that House Speaker Nancy Pelosi was not on board, McGovern countered that she pushed for the revival of a House climate change panel. Likewise, Markey swatted away a confrontational question about the inclusivity provisions in the resolution. The senator said during Franklin Roosevelt’s New Deal came into law, Dixiecrats inserted provisions that intentionally excluded blacks in countless ways. The Green Neal Deal’s language aims to bring in various groups to avoid any negative outcomes that fall on any one group more than another. But overall the effort, in front of a friendly Paradise City audience, felt tailored to going on offense. From the beginning the Green New Deal, a nonbinding resolution, has been described as a statement of principles. It is, in essence, a challenge to Congress to begin writing a panoply of legislation to address the ongoing threat of climate change. “It’s meant to trigger a national debate on all of the individual prescriptions,” Markey told the town hall. He hammered this point on succeeding questions. However, shortly after the resolution’s release, its critics have spun it as something at best unrealistic and at worst sinister. A since-withdrawn FAQ sheet gave Republicans just enough ammo to falsely describe the resolution as plotting the abolition of air travel and the impoundment of cows, or at least their gas. This is to say nothing of absurd claims about Socialism that rob the term of any meaning. “That’s what they do when they don’t have any facts on their side,” McGovern said of GOP tactics. McGovern is correct. Normally such PR chicanery would redound to little more than Beltway and Acela corridor hand-wringing. It certainly will not stop Democratic-controlled House committees from drafting legislation. But Democrats only control part of Washington and they want to enact these ideas. With the GOP’s outlandish claims remain plausible in the minds of many, if not all Americans, there may be insufficient pressure to force the Senate to act or Donald Trump to sign any legislation to say nothing of campaigning on the matter next year. Markey noted how the GOP had read the resolution’s ambiguous line about providing universal healthcare as implementation of single-payer, complete with a 20-25 trillion-dollar price tag. “That’s not in the resolution any more than banning nuclear power or carbon-capture sequestration,” Markey said. Markey was not particularly hopeful that Senate Republicans would put any substantive climate legislation to a vote. Even the prospects for productive Senate committee hearings seem dim. Consequently, Markey said, he would be doing events like this across Massachusetts. He has held another in Somerville already. The senator said he would go anywhere else in the country to explain the resolution’s purpose and its merits. “It’s more than a resolution, it’s a revolution. It’s going go to challenge every committee in the House and the Senate to react to this threat,” Markey said to the press before the event. But that rhetoric aside, Markey also injected some realpolitik and reflection. Throughout the night, he referenced the Waxman-Markey climate change bill. That legislation got through the House a decade ago, when Markey was a still a rep. However, it died in the Senate. He said there were more hurdles then. Today, he said, coal mining job have fallen by a third even as renewable energy jobs have boomed. But such factoids, while relevant, do not always move people. Climate change, while an existential threat, has long been theoretical for many. Now that its effects are apparent, many feel it is beyond our capacity. One attendee echoed that sentiment, lamenting the difficulty of changing corporate farming interests. Agriculture is one of the biggest sources of greenhouse gases. McGovern, who also sits on the Agriculture Committee, said curbing big money was part of it. However, he also said there had been slow and steady progress. Farm bills did not even acknowledge healthier crops or sustainable farming before. Now they do. Markey observed that another change in the last 10 year has been the rise of a generation that is, frankly, pissed off, their elders are handing off a dying planet. “I think that Millennials and younger people continue to look at the science and say ‘how can the preceding generations hand over an existential threat that we’re going to spend our entirely lives dealing with,’” Markey said.